Links to download this digital book in PDF, EPUB and MOBI formats will be provided with your order confirmation and will also appear in your order confirmation email. If you create an account in our online store, you will also be able to access your downloads there. 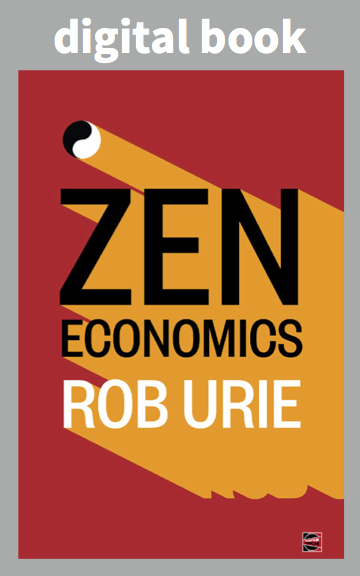 Zen Economics addresses the background philosophical issues around economics, science and technology to place them in context and then applies the results to work and labor, income and wealth distribution, environmental crisis and animal rights. Zen enters as absence, as radical humility toward what is knowable and what is known. This view derives from years spent with the base texts of existential philosophy, from correspondence between Martin Heidegger and D.T. Suzuki around the relationship between Heidegger’s ontology and Zen and from Buddhism as a practical, non-deistic, philosophy of life. The book ends with a political program that emerges from four decades of political activism. Rob Urie is an economist, writer, artist and musician. He contributes regularly to CounterPunch. Published by CounterPunch 2016. Digital Book. 244 pages.